Buttery pecan crust filled with a smooth and spicy pumpkin pie filling make this vegan Praline Pecan Pumpkin Pie a dessert your guests will remember and request every holiday meal. 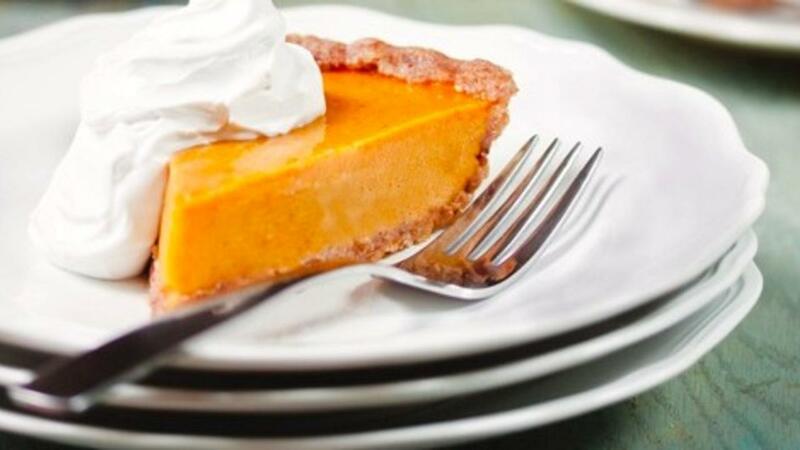 As a (recovering) perfectionist, it took years to perfect my pumpkin pie recipe. The secret turned out to be blind-baking the crust (baking it empty) and cooking the filling on the stovetop for a reliable, crack-free custard every time. Using two secret ingredients as thickeners (instead of the ubiquitous tofu that gives a chalky mouthfeel), presents a luscious, creamy texture that allows the warming spices to shine through. And using coconut sugar brings a caramelly note to the flavor, and makes it so that those who are sensitive to refined sugars can delight in dessert too! 1. Crust: Preheat oven to 375°F. On a sheet pan, spread pecans and toast for 12 to 15 minutes or until fragrant and browned. In a food processor, process pecans, coconut sugar, coconut milk, brown rice flour, vanilla, and salt until fine. Into a 9-inch pie pan, press pecan mixture evenly into bottom and sides. Bake for 10 minutes. 2. Filling: In a small bowl, soak agar in hot water, stir, and set aside for 5 minutes. In a blender, add pumpkin purée, coconut milk, coconut sugar, vanilla, salt, spices, and agar with its soaking water. Blend until completely smooth. In a small bowl, add kuzu and cold water and stir until completely dissolved. Set aside. Into a 3-quart saucepan over medium heat, pour filling mixture and bring to a boil, whisking occasionally. Reduce heat to low and simmer for 5 minutes, then stir kuzu mixture again and then add to filling, whisking continuously. Simmer and continue to whisk for 2 to 4 minutes until mixture reaches a pudding-like texture. 3. Pour pumpkin filling into baked crust and let cool completely to set up. Serve at room temperature or chilled. Top with Homemade Coconut Whipped Cream and garnish with a dusting of cinnamon.